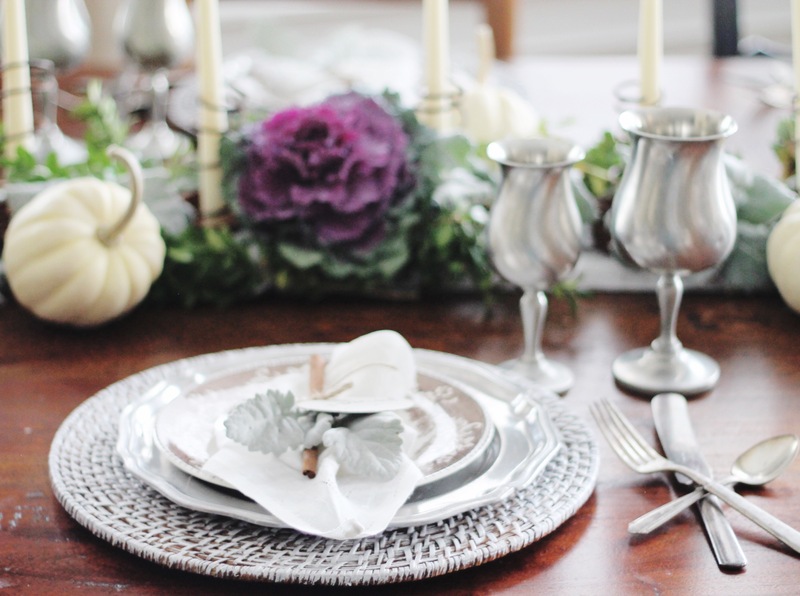 Can you believe it is November and Thanksgiving is only two and a half weeks away! I can’t believe it. 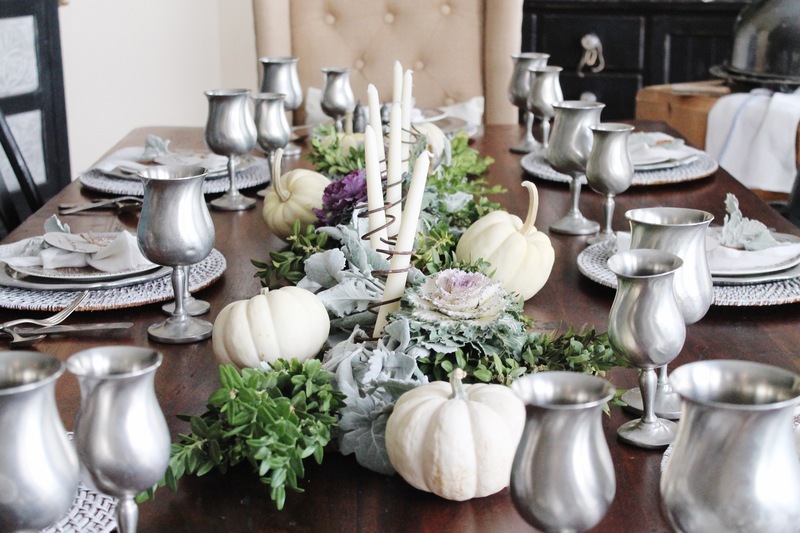 With Thanksgiving so close we thought we would show you our tablescape for our Thanksgiving dinner this year. 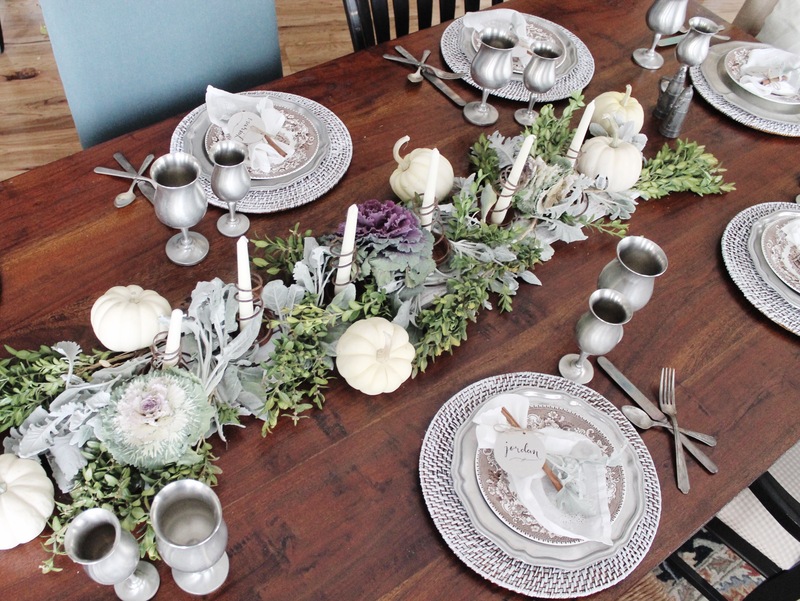 We are doing it in hopes to get you inspired and give you some new ideas for your Thanksgiving dinner table. For our centerpiece we started with a candle holder that we made. We made it by attaching old bed springs to a piece of wood. We then stuck candle sticks in the springs. We are selling these bed spring candle holders at our furniture sale so if you’re in Idaho come check them out on November 18th and 19th. 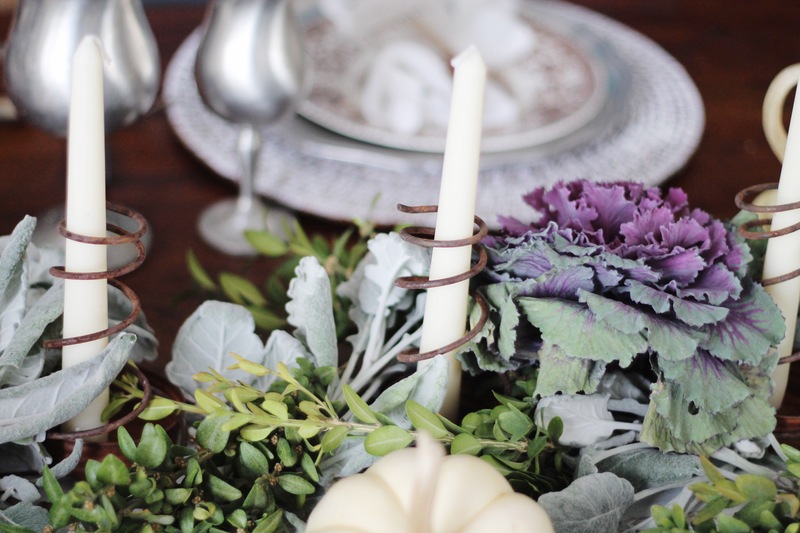 We then placed dusty miller and boxwood branches around the candle holders. 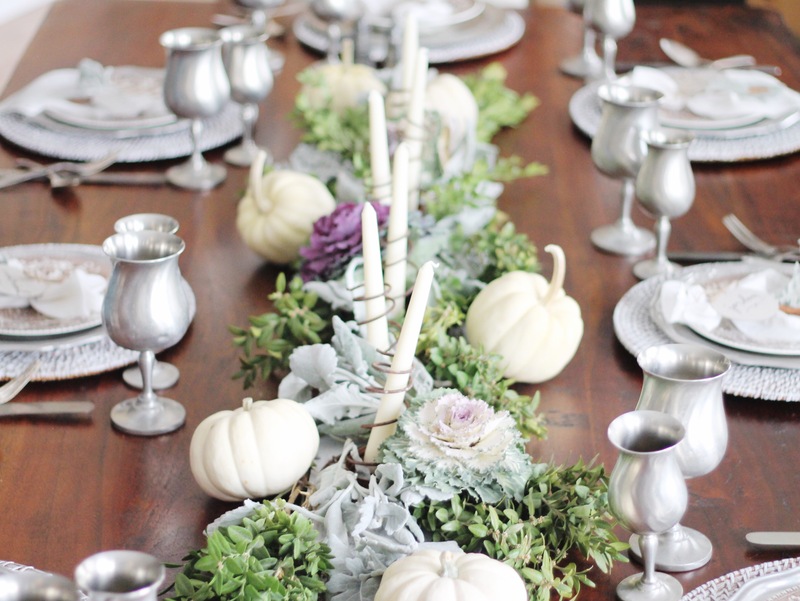 We then placed cabbage plants throughout the center of the table and white pumpkins. All the plants came straight from the yard or our potted plants. 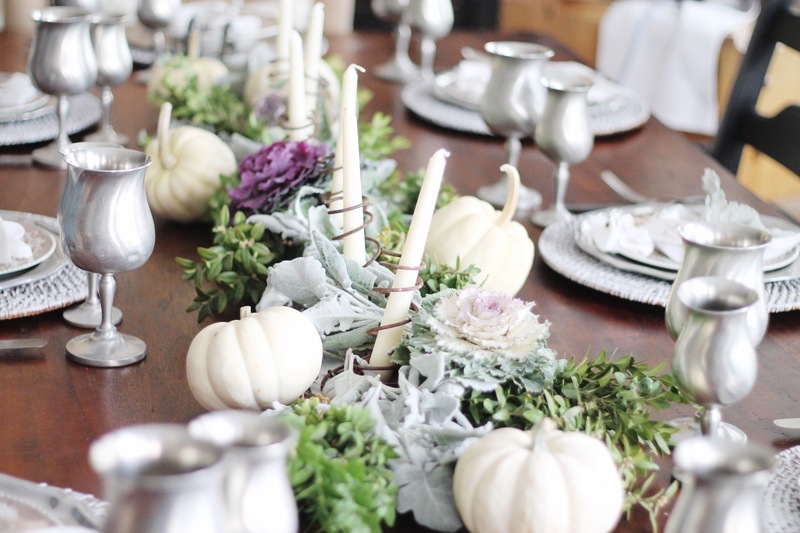 They all should still be living through Thanksgiving so they are perfect for a late November centerpiece! For the place settings we started with the place mat. We found these at the thrift store and white washed them. We used our vintage silverware and decided to set them in this unique cross cross pattern. 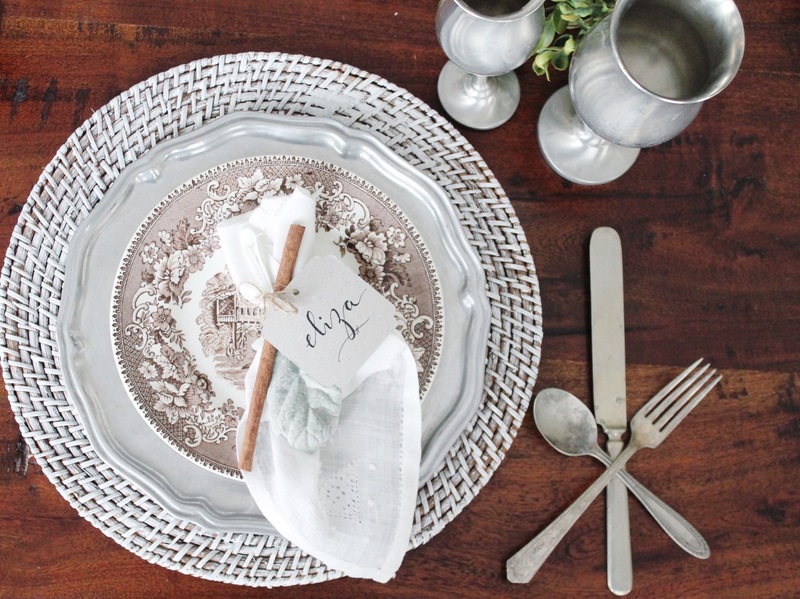 For the plates we used our pewter plates along with a smaller brown transferware salad plate. 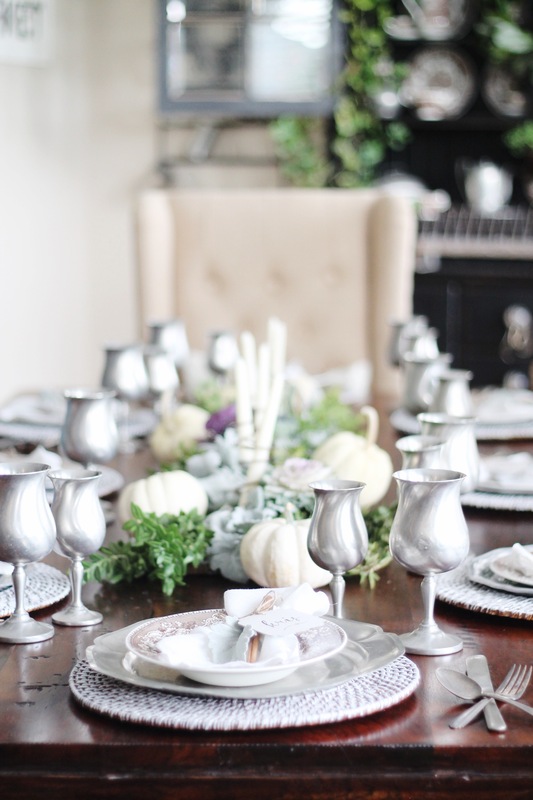 For the water and beverage cups we used our pewter wine glasses. The last part of the place setting is the napkin along with the place cards. 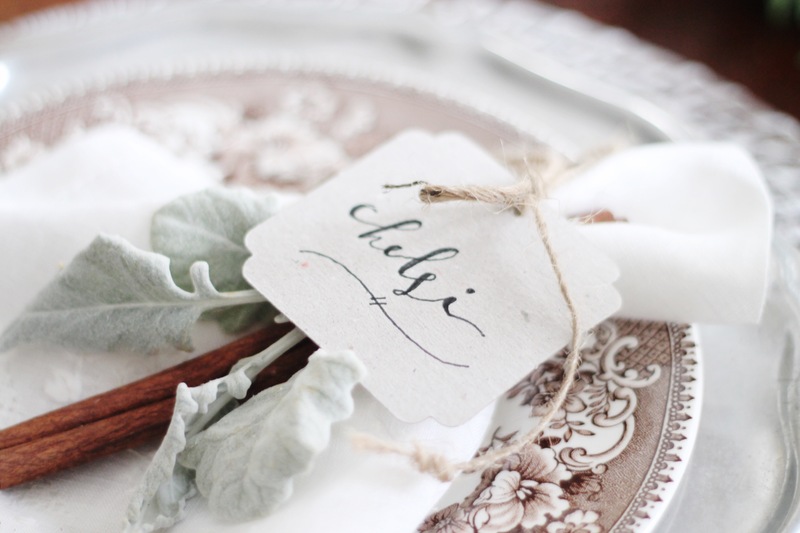 We tied some Dusty Miller along with a cinnamon stick to the napkin. We also added these place setting cards to the napkins. I hand wrote all the names on the back of Christmas tags. 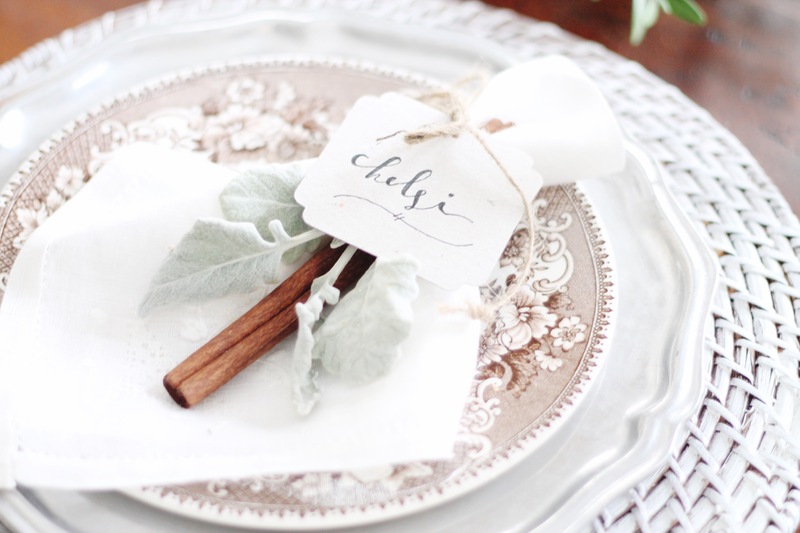 They were so easy and the perfect simple place setting. We placed the turkey platter on our cutting board table. It is sitting close to the table where my husband will sit so he can carve it. 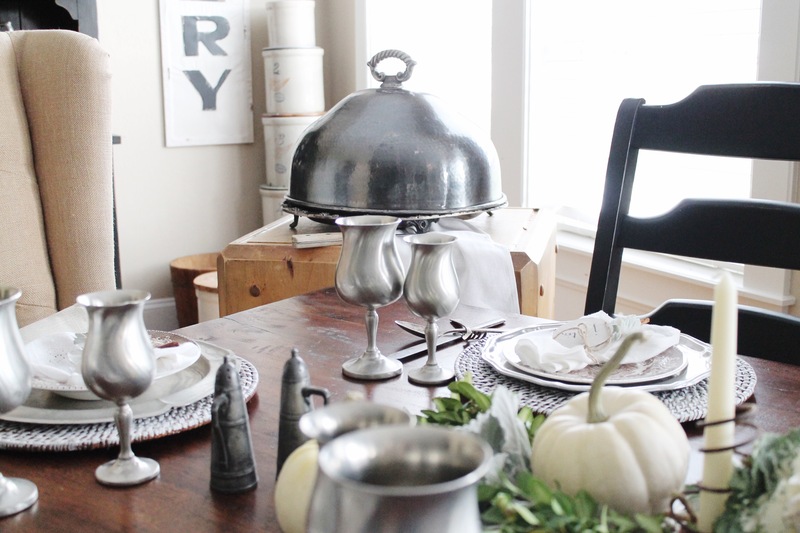 All the other dishes should be able fit around the table on Thanksgiving day. In the next two weeks we are going share with you two of our favorite Thanksgiving recipes, so stay tuned. This table setting was fun to come up with. We used things we already had and came up with something beautiful for Thanksgiving. 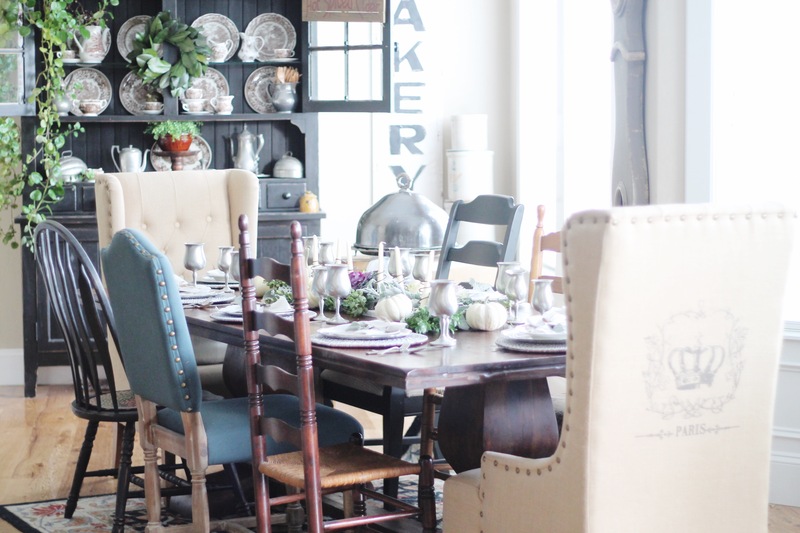 We hope you enjoyed this Thanksgiving table and hope we inspired you to get ready for your Thanksgiving dinner. whoa!!! this looks like its out of livingetc magazine!!!! gorgeous!!! 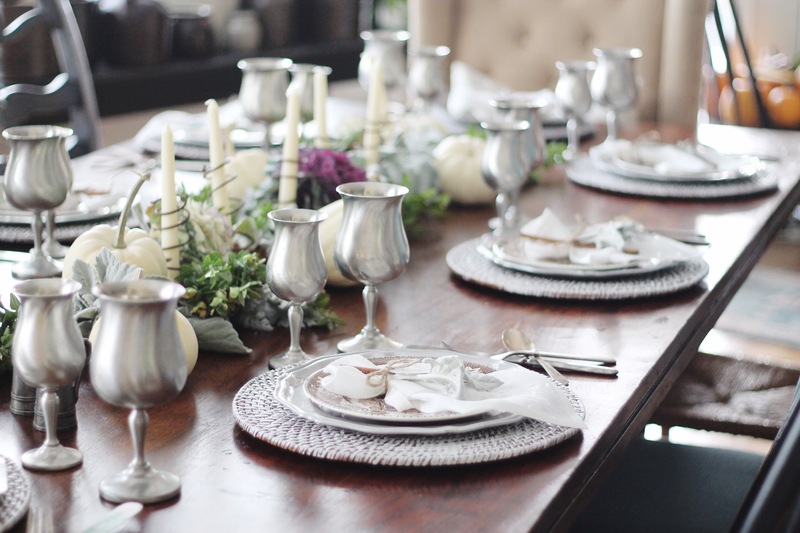 love your tablescapes!! Thank you so much 😊 that was one of the sweetest comments.